Textbook broke campaigns are popping up around campuses as textbook prices continue to soar and students are becoming aware of the free, open educational resources (OER) available to them. The UVic Student Society (UVSS) is getting ready to launch a social media campaign in early September to bring awareness to their campus. We recently had the chance to catch up with one of the faces behind this mission, enter: Maxwell Nicholson. Maxwell Nicholson is the Director of Campaigns and Community Relations with the UVSS and a business and economics student who shares with us the motivation and goals of the campaign, and how you can get involved. What prompted you to start a textbook broke campaign? When we were running for election, the B.C. Open Textbook Project came on our radar and we knew that this was an issue that was important to students. When we started to use the message of “Free Textbooks” we were met with high disbelief even after explaining the program. This is when we realized that students take for granted the high price they pay for textbooks. After being elected into office, we began to dig deeper into the issues in the textbook industry. 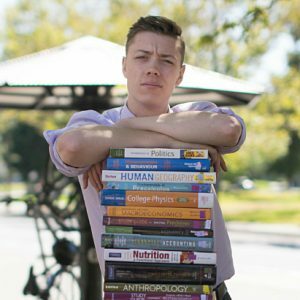 Reading statistics like “23% of students regularly go without textbooks” and “textbook prices have risen 3x the rate of inflation” have confirmed our suspicions that this market is not operating how it should be – consumers have little influence on the price of the textbooks they are buying. This motivated us to commit wholeheartedly to the #TextbookBroke campaign. 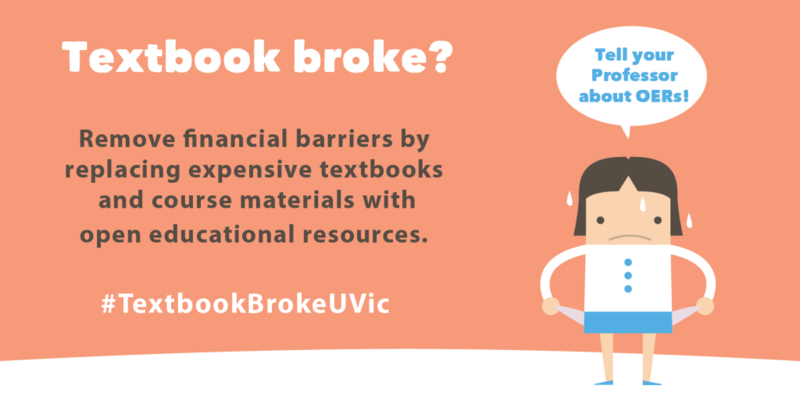 What is the UVic #TextbookBroke campaign? The UVic #TextbookBroke campaign was modeled after the Alma Mater Society of UBC and Simon Fraser Student Society initiatives from last year, and I have been fortunate to develop a close relationship with the two institutions and learn from their experience. The first step of this campaign is outreach – in early September when students are buying their textbooks we plan to be outside the bookstore raising awareness of the issues. We hope to spark a discussion that will continue onto social media with our hashtag contest. Every UVic student who uses the hashtag #TextbookBrokeUVic will be entered into a draw to win a $300 gift card to help pay for textbooks and as well as other swag prizes. Throughout the year we will continue to do outreach and poster campaigns to bring the issue to the forefront of students and professors alike. An OER forum is also in the works, bringing university administration, professors, and possibly publishers to talk about affordability. At the end of the fall semester, we will encourage students to use course surveys as a method to make professors aware of the issues. Are there any outcomes you hope to achieve as a result of the campaign? The campaign’s main goal to increase awareness of open education to students and faculty, the more everyone knows about the issue, the easier it will be to bring more open textbooks to campus. This outreach supports our work on the ground, meeting with professors individually and using our networks to promote the resources, in immeasurable ways. Of course, open textbook adoptions are the end goal, but awareness is the first step. For student advocates wanting to campaign on this issue, the number one way to succeed is to get connected. In B.C., there are excellent resources in this area through BCcampus, the Alma Mater Society of UBC and the Simon Fraser Student Society with really great people who would love to help. Alternatively, Maxwell Nicholson is always just an email away and would love to connect with other students and societies. The materials, research, and support are there to push open educational resources to the forefront – It is time to turn the page on unaffordable textbooks and every student is integral in that process.